A series of creative pieces relating to a 19th century Bostonion cursed with prophetic dreams. The Nightmare Maze: Lose yourself in the depths of a tormented psyche and try to find the logic to the night terrors in this haunting text-based multiple-choice game. It can be played on the web, iOS, and android. 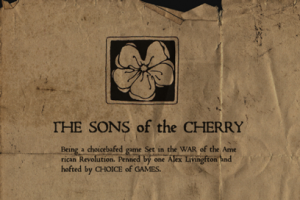 The Sons of the Cherry: A game of espionage and arcane magic in the American Revolution. Choose a side or go it alone in the secret war for the soul of the new nation. Use multiple magic disciplines to reach your goals and change history. Play it here on web, iOS, or Android. The Gillingham Problem: Stave off madness in order to solve the mystery of a man’s dark dreams. A Storynexus game. Play it here. Stage Play: Waking Cassandra, a three-act drama, developed as a part of the Road Less Traveled Productions Emanuel Fried New Play Workshop in Buffalo, NY. Find it here. Comic: In the style of Windsor McCay. Check it here.